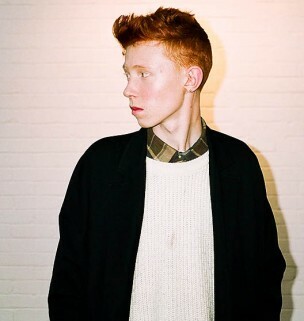 Archy Marshall is slight, even frail looking, very pale beneath his blazing red hair. He looks like Archie Andrews bereft of both Betty and Veronica, disillusioned with Riverdale’s middle class complacency and seriously considering selling the jalopy to fund a year of hitchhiking around the country. He’s the classic mishmash of youthful naiveté, vulnerability, and unmeasured self-confidence. But oh, that voice. The snarling, even grating baritone has always been the attention-getter for Marshall, who is, depending upon the project, AKA Zoo Kid, DJ JD Sports, Edgar the Beatmaker, or King Krule. His voice is compelling, but it’s just one of the many contrasts that make Marshall so fascinating and critically adored—the baby Brit with the big voice, the little lad with the sad songs. And though he’s been on the scene under his various names for three years now, he is just a boy: 6 Feet Beneath the Moon, his debut full-length album, was released on his nineteenth birthday. 6 Feet opens on a high; single “Easy Easy” is brimming with pop potential, and on an album heavy on introspection and Marshall’s booming monotone, that’s a rarity. Other standouts include “Cementality,” very nearly a spoken word piece over eerie backing keys, and “Neptune Estate,” a lovely bit of nineties-inspired trip-hop featuring a hypnotic drum machine and tastefully muted horns. But the album’s best track is “Out Getting Ribs,” an Archy Marshall classic originally released in 2010, when he was still going by Zoo Kid. It’s been re-recorded, losing some of its charm and intimacy during the leap from Marshall’s original laptop recording to the studio, but all the elements are there: the lovely, almost haunting guitar riff, the heavy echo, and of course, the painful, primal howl. The album does falter, a consequence of its 52 minute length, and aspects of Marshall’s sound that seem endlessly arresting at its opening become almost yawn-worthy by its end. Not all the tracks work, either. Marshall dabbles with jazz percussion on “A Lizard State” with less than dazzling results, and songs like “The Krockadile” feel scattershot, perhaps even through-composed, rarely a good look for a rock record. Here lies Marshall’s weakness: his enthralling aesthetic sometimes camouflages structural lacking. No sing-along choruses here, folks. And over the course of 6 Feet’s near-hour running time, the thrall begins to wear a bit thin. Still, these issues are minor compared to the scope of King Krule’s accomplishment. 6 Feet Beneath the Moon is aesthetically gorgeous; Marshall’s complete command of his sound belies his years, yet he’s unafraid to experiment with everything from ambient to jazz. So what if he doesn’t stick every landing? His form is still on point.